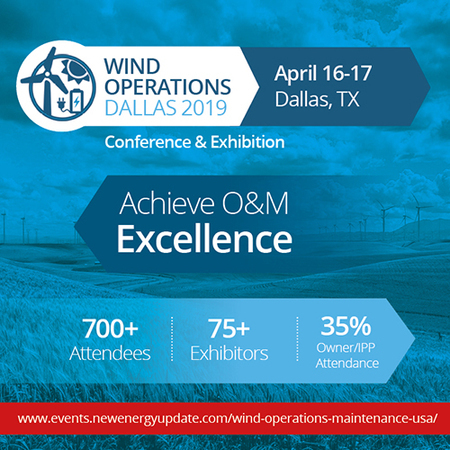 The 11th Annual Wind Operations Dallas 2019 (April 16-17, Texas) is the world’s premier event for wind O&M and asset management business leaders, project stakeholders and service specialists. Wind Operations Dallas will draw together 100 professional speakers, 75+ exhibitors in our exhibition hall attendance of over 700 senior level executives and managers attendees in 2019, of which over 35% will be asset owners (Utilities, Independent Power Producers, Investors). Renowned as North America’s most significant business meeting place for Wind O&M and Asset Management professionals, this is where the industry comes to learn, network and do business. It’s the preeminent hub for the very latest insights, cutting edge tech and executive perspectives you need to reduce LCOE, increase AEP and drive up wind portfolio revenue. Contact Jon Harman today: jon@newenergyupdate.com to find out more.